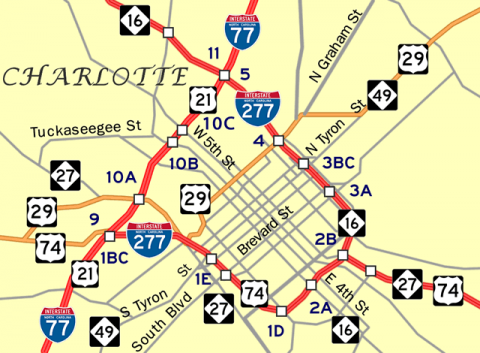 Interstate 277 loops 4.46 miles east from I-77 & U.S. 21 around the Charlotte central business district along the Berkshire and Belk Freeways. N.C. 16 overlaps with the northern half of the inner belt freeway for 2.47 miles between I-77 at Greenville and the couplet of East 3rd/4th Streets. U.S. 74 accompanies I-277 along the southern half of the loop for 2.36 miles east from I-77 and Wilkinson Boulevard at Biddleville to Independence Boulevard. 2017 traffic counts recorded by NCDOT along I-277 top out at 132,000 vehicles per day. U.S. 29 & North Carolina 49 (Graham Street) northbound at the Brookshire Freeway. A loop ramp follows for I-277 & NC 16 north ahead of 12th Street. Photo taken 12/08/99.